Networking is an important part of career development. Think about it for a minute. Have you or someone you know of received a job because they know someone at the company? Many companies now favor this since it gives them an opportunity to hear a bit more about the person then what is written in their cover letter and resume. There are many ways to put yourself into networking environments. Many times if you are a member in different societies (example: Project Management Institute) you will have that opportunity to socialize and network with others. 2. Have business cards ready to hand out and if you receive one make sure you follow up with the person via email several days after the event. 3. Be ready to small talk and always follow up with a question to the person you are speaking with. 4. Try to attend different events in your community or you may find that you are attending the same meetings and meeting the same people. Also, there is a new type of social networking on the internet. LinkedIn, is one example of this. LinkedIn is a professional networking site where you can reconnection with old colleagues and friends to see what they are up to professionally. Another example is Facebook. Facebook (90 million users) primarily draws in the Gen-Y and Gen-X crowd and it allows them to easily reconnect with old colleagues, high school and college friends and others associated with the same organizations. It also allows you to post photos and videos to let your “friends” know what you are up to. Just like project management, networking has changed over the years. We must embrace the changes and find out what works for our organizations and for us personally. 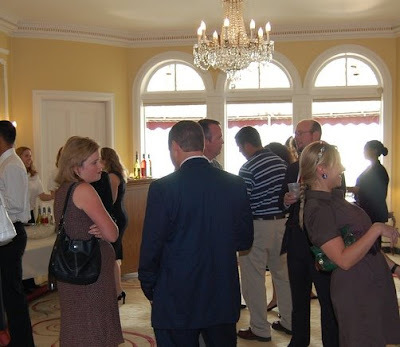 Photo: Networking event with MAGNET (Madison’s Next Generation of Leaders) at the Governors’ Mansion 20Aug2008.